Deacon James became a Catholic in 1985, and was called to Diaconate 1991 and Ordained in 1996. He has been married to Stephanie for 39 years and have 5 Children and 6 Grand-children. He currently serves at Our Divine Savior and on occasion helps out at St. John the Baptist. Deacon James currently leads the Catholics Returning Home Ministry, RCIA ministry, is instructor of the Baptism Classes, and is chaplain for the Chico Police, and does spiritual and peer counseling. 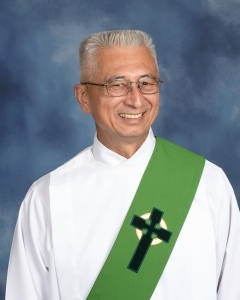 Deacon James has a servant's heart and loves serving the Chico community.